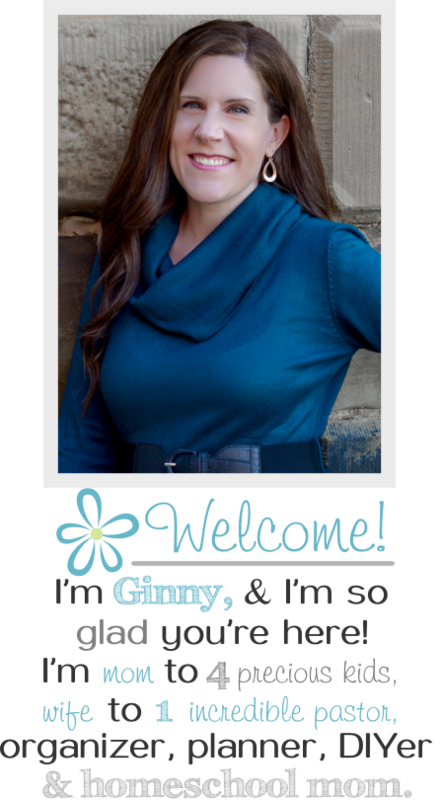 If you missed it yesterday, I announced a super exciting project I’m working on! 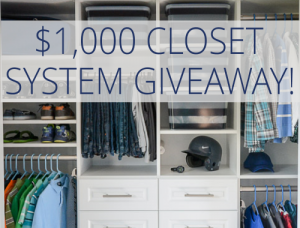 How would you like to win a $1,000 custom closet makeover by EasyClosets? I’m teaming up with this awesome company to show you some fabulous organizational inspiration AND give one of you the opportunity to get your closet beautifully organized! All three of my girls share the same bedroom and one closet. 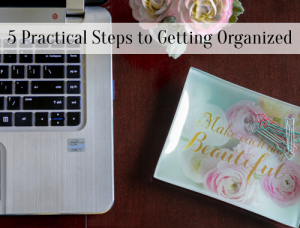 It can get disorganized very quickly! I have tried many things to help them over the years, but nothing solved the problems we were having. Then I met EasyClosets. 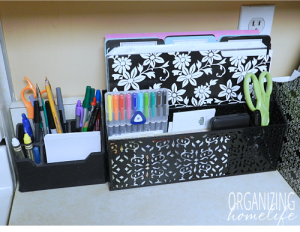 Welcome, organizational heaven. They have an incredible team of designers that work with you (for free!) to design the best closet for your needs. I poked around on their site and came up with a basic idea of what I was thinking. Then I worked with Mikey, one of their incredible designers, who walked me through what would work the best, and what I should avoid. Here’s what we came up with. By the way, check out their online design tool, it’s just plain fun to see what possibilities you have for your closet. 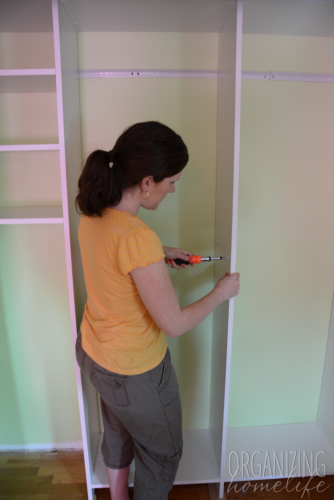 All you need to do is enter your closet’s measurements. 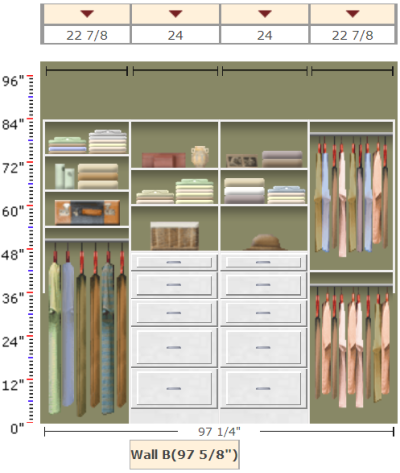 Their closets are totally customizable to your specific space, so your closet will be used to it’s maximum potential. Isn’t it amazing? So let’s get building! Let me just tell you that I have unpacked a lot of boxes in my career as a blogger. 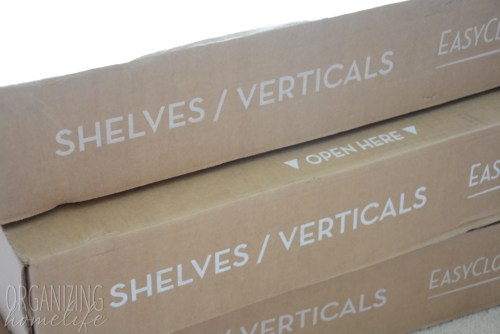 I get packages from companies all the time, both for work and personal items I purchase online. I have NEVER encountered such care in packing. I know it’s not exciting to see a picture of a box, but even my husband said I needed to show this. We were totally impressed with the attention to detail. 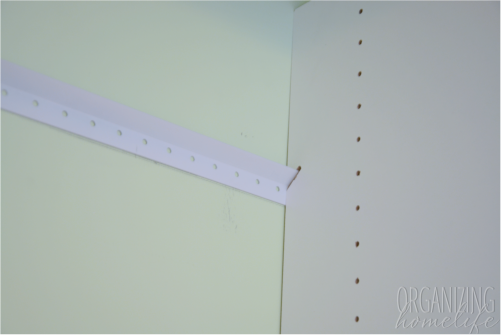 Of all the pieces we needed for this closet, not a single piece was damaged or missing. It was incredible. Every single box is clearly marked with its contents. They even send an “open this first” box. Are you starting to understand why their company is named EasyClosets? Uh huh. So after almost 7 years of living here, we finally took out those ugly shelves and painted the closet. 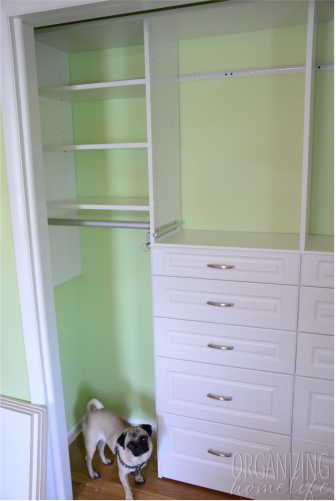 I normally like painting closet interiors white, but I thought the green would look so much nicer in the girls’ room closet since we chose a white finish for the closet. 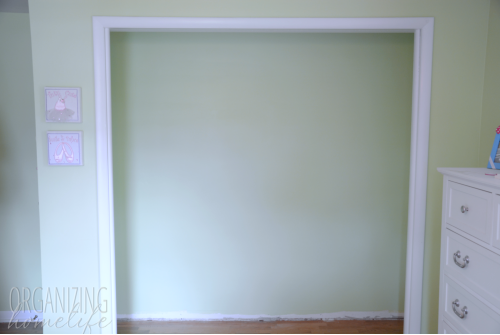 Although it’s not necessary for many of the EasyClosets designs, we decided to take out the baseboard and put in new ones around the closet system. After the painting was done, we prepared to hang the main track support by making sure we screwed into studs and our line was level. Once the horizontal support track was installed, we hung the vertical panels. The parts were so clearly labeled it made putting this closet together very simple. 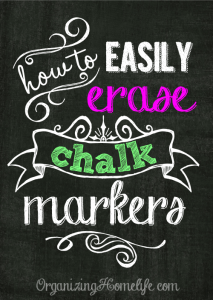 Time consuming, yes, but easy: definitely. I wish these pictures could speak to tell you how nice the quality of this product is. I tried to get the best shots I could, but let me just assure you that the quality here is far superior to what you would find at a home improvement store. Just saying. The drawer tracks glide SO smoothly. 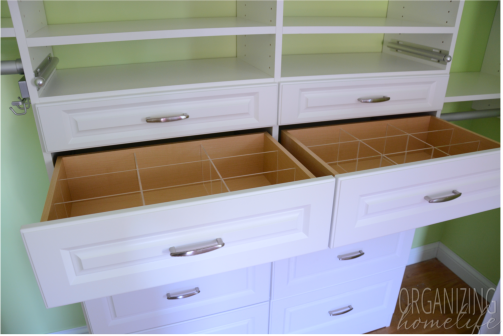 I chose the soft close drawers which is a feature that I love. 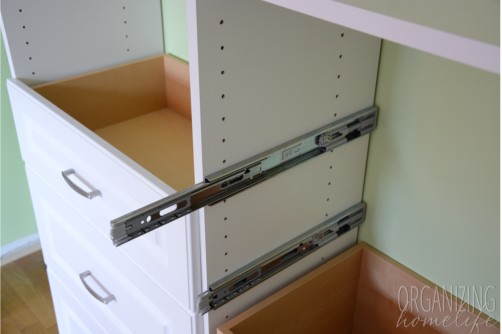 No more slammed drawers or pinched fingers! I will tell you that it took me about four hours to put the drawers together. I took my time to make sure they went together well. 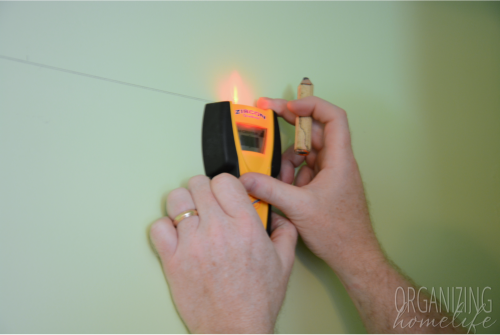 The instructions were easy to follow especially once I familiarized myself with the parts. I would definitely recommend putting the tracks together on a hard surface (like the floor) and not on a carpet. There is some grease in the tracks that you wouldn’t want to get on your carpet, but it was also very helpful to line them up exactly even with the drawer. If you haven’t met our dog, Bentley, he is by my side 24 hours a day and occasionally likes to photo-bomb my blog pictures. So what do you think so far? I know I’m in love! I can see SO much potential for these drawers. Check out the hosiery dividers. So there you have it. Tomorrow I’ll show you how I organized it. 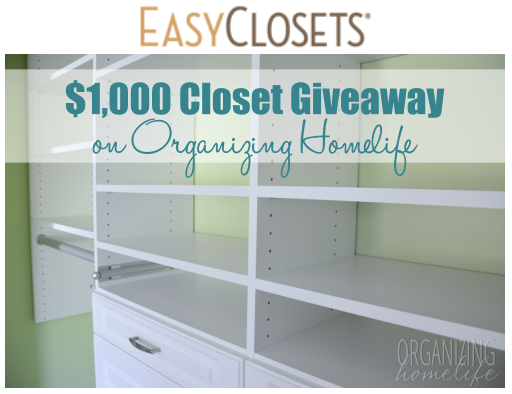 And definitely don’t miss Tuesday’s post where YOU can enter to win a closet makeover by EasyClosets for YOUR home! Disclosure: I was given an EasyClosets organizing solution to review. All opinions are 100% my own. I never post about products I do not recommend or use in my own home. See my full disclosure policy here. I love this! I will definitely be checking it out for my son’s room which is small so a dresser takes up a lot of room, but closet is not fully used. Thanks so much for your honest opinions!! It’s really great looking! I hate buying things I know are going to fall apart with real life use. Does it seem like it’s going to hold up well in the long term? It looks promising! This is a great option. I love how it turned out. Can’t wait to see how you organized it. That closet is stunning!! I’ve been looking for a good system for my girls bedroom. My oldest daughter has decided to live with us full time which means shared bedroom and closets. This system would be amazing. And I love how they ship it. That hoot caught me eye before reading what you had to say about the shipping and I was impressed at the care. Glad to know it was that way for everything. I love how easy this goes together and how everything can have a place and look so beautiful when you open the closet door. Beautiful! Would love to see a pic with all the clothes in it. I love what you are doing to this closet! 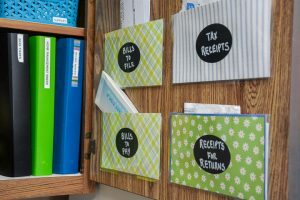 I could really use something like this to store all of my stuff out of the way! Its Beautiful! 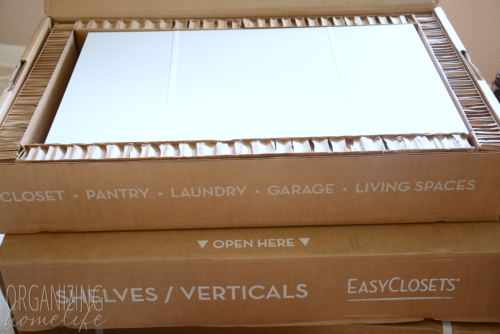 I can vouch for the quality and customer service of Easy Closets. I designed my Master – very large walk in with a weird Lshape and my sons closet about 8 years ago. The quality is amazing, it is holding up amazing and still looks new despite heavy use. We also used Easy Closets Garage System and this too was easy to install and has held up wonderfully for about 6 years. I took a risk with this company as I had only heard of them through a google search. 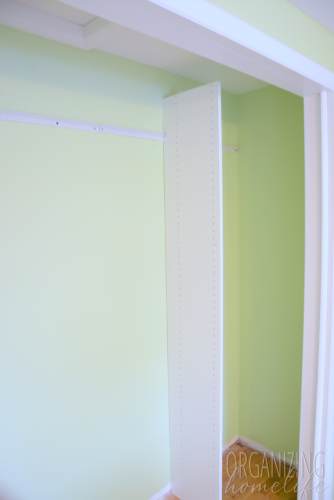 I had closet companies quote me 4 times what I paid for my Easy Closets System. I have referred many friends to them and those who have used them race about them, while those who didn’t are complaining about the system they ended up with. 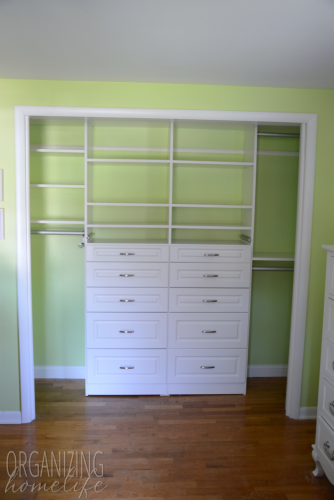 I have been looking for a closet system for my master bedroom. I have tried the Elfa system in my office’s closet but was was not impressed with the wire baskets and finishing touches. I am excited about looking at this system. Very impressed. I always love a neat closet. I hang up almost everything I own, so I have always been afraid that a closet system would be a waste of money. But they look so pretty. I would be very interested in playing around on their website though…maybe I could create something just right with enough hanging space and drawers. Fun. Would love this but my closets unfortunately only has a single door. Have yet to see a system that would work with that and I cannot afford to widen it. How do we enter to win? I could totally use this in my daughter’s bedroom! 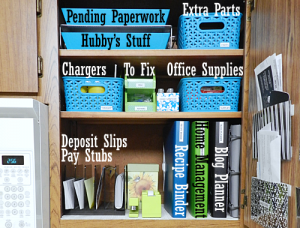 Love, love , love this organizing unit. I think it would solve so many problems in my husbands closet although I must say I would be jealous if I won and then his walk in closet looked better than mine. He truly needs it first and it would be my gift to him, he is going through some tough medical times and it just might just be the thing to help cheer him up. 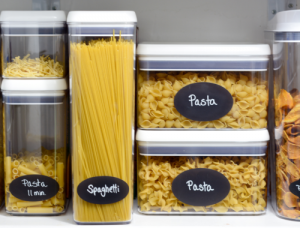 This closet organizer is really the ultimate in organization for all his clutter. My husband and I just bought our first home, we have lived in Government quarters since the day we were married and now that he is retiring and he new chapter I need to install closets in the bonus room of our new home do we have room for our grandchildren and great grandchildren when they visit us. Love it! Thank you so much for the inspiration and the great info. 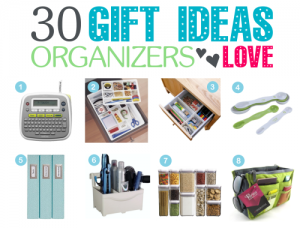 I am in love with what you have shared and hope to change my life to organized living! Thanks so much!!! My wife reorganized every closet in the house but ours. Our closet has one shelf and clothes rod on each side. She takes care of me and our six kids and two grand kids. She spends so much time doing for others and forgets to do stuff for herself. I pinned this because I love the closet, but I also love the paint color! Do you still have the name and brand of the paint? Thanks!